Click the image below and join us as we take a trip back to Fright Fest 1999 and watch the high-energy performance of Dr. Fright's Final Freakout. 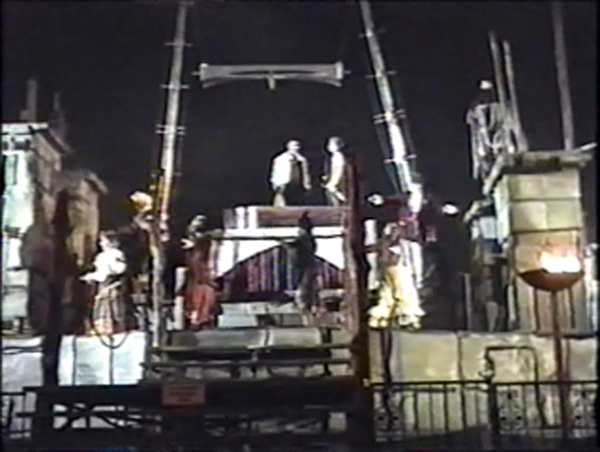 The show, which was performed on a stage atop the main fountain area, was presented when the park's clock struck closing time and served as a fun "kiss goodnight". Enjoy! Allow a few moments for the video to start. The 15 minute show is a large file. I miss it, it was nice having a finale for FF. FFs were so much better back then. I can rember that I was there for one of those shows. They were great. Hope they do something like that again as I am a season pass holder again. 99 was the last time I was.